From leading authorities, this volume presents a unique evidence-based group intervention for the 10-15% of children who are challenged by peer difficulties in elementary school. The book features 107 engaging full-color reproducible handouts, posters, and other tools. In addition to teaching core social skills (participation, communication, cooperation, good sportsmanship, conflict resolution), the Friendship Group promotes emotional understanding and empathy, self-control, and effective coping with social stressors. Two complete sets of sessions are provided (grades K-2 and 3-5), including step-by-step implementation guidelines. The large-size format facilitates photocopying; purchasers also get access to a Web page where they can download and print the reproducible materials. Karen L. Bierman, PhD, is Evan Pugh University Professor, Professor of Psychology and Human Development and Family Studies, and Director of the Child Study Center at The Pennsylvania State University. Since the 1980s, her research has focused on social-emotional development and children at risk, with an emphasis on the design and evaluation of school-based programs that promote social competence, school readiness, and positive peer relations, and that reduce aggression and related behavior problems. She also directs a predoctoral training program in the interdisciplinary educational sciences. 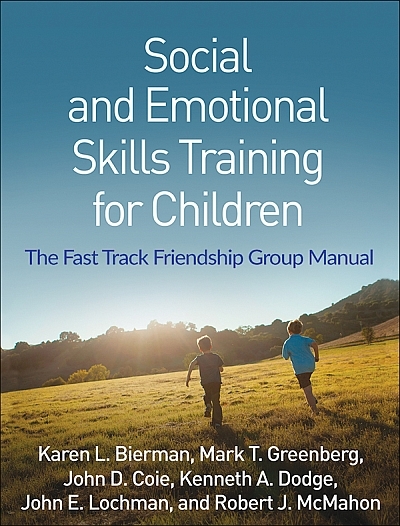 Dr. Bierman has published several books and over 175 articles and chapters, and has served as an educational advisor to a number of organizations devoted to improving early education for disadvantaged children, including Head Start and Sesame Workshop. Mark T. Greenberg, PhD, holds the Bennett Endowed Chair in Prevention Research in the College of Health and Human Development at The Pennsylvania State University, where he is Founding Director of the Edna Bennett Pierce Prevention Research Center. He is the author of more than 300 journal articles and book chapters on developmental psychopathology, well-being, and the effects of prevention efforts on children and families. Dr. Greenberg is a recipient of numerous awards, including the Urie Bronfenbrenner Award for Lifetime Contribution to Developmental Psychology in the Service of Science and Society from the American Psychological Association. One of his current interests is how to help nurture awareness and compassion in our society. John D. Coie, PhD, is Professor Emeritus of Psychology: Social and Health Sciences at Duke University. He is a past chair of the National Institute of Mental Health grant review panel on prevention research. Dr. Coie's research has primarily focused on the development and prevention of serious antisocial behavior. He retired from Duke in 2000, but continues to be involved with the Fast Track program and has developed and co-managed a program in Santa Barbara, California, for providing non-English-speaking Hispanic children with computer-based English language and reading training. He continues to be active in programs designed to reduce violence and recidivism in the community. Kenneth A. Dodge, PhD, is the William McDougall Professor of Public Policy and Professor of Psychology and Neuroscience at Duke University, and Director of the Duke Center for Child and Family Policy. His research focuses on how problem behaviors such as chronic violence, school failure, drug use, and child abuse develop across the lifespan; how these problems can be prevented; and how communities can implement policies to prevent these outcomes and instead promote children’s healthy development. He has developed, implemented, and evaluated several intervention programs that are based on this research. Dr. Dodge currently leads the Durham Family Initiative to prevent child abuse in Durham, North Carolina. John E. Lochman, PhD, APBB, is Professor and Doddridge Saxon Chairholder in Clinical Psychology at the University of Alabama, where he is Director of the Center for Prevention of Youth Behavior Problems, and Adjunct Professor of Psychiatry and Behavioral Sciences at the Duke University Medical Center. He has authored more than 400 scientific articles, chapters and books on the causes and consequences of highly aggressive behavior in childhood, and on intervention effects with these children. His current work is particularly focused on dissemination research. Dr. Lochman has served as Editor-in-Chief of the Journal of Abnormal Child Psychology and is a former president of the Society for Child and Family Policy and Practice (Division 37 of the American Psychological Association) and of the American Board of Clinical Child and Adolescent Psychology. He is a recipient of the Distinguished Career Award from the Society of Clinical Child and Adolescent Psychology (Division 53 of the American Psychological Association). Robert J. McMahon, PhD, is Professor of Psychology at Simon Fraser University in Burnaby, British Columbia, Canada, where he is also LEEF BC Leadership Chair in Proactive Approaches to Reducing Risk for Violence among Children and Youth. To carry out the work of the Chair, he directs the Institute for the Reduction of Youth Violence. He is also a senior scientist at the BC Children’s Hospital Research Institute in Vancouver. Dr. McMahon’s primary research and clinical interests concern the assessment, treatment, and prevention of conduct problems and other problem behavior in children and youth, especially in the context of the family. He is author or editor of numerous books and has published more than 225 scientific articles, chapters, and reviews. He is a past Editor-in-Chief of Prevention Science and serves on the editorial boards of four other journals.